Standing on the outskirts of Uzgac, a cluster of houses on a muddy road just two kilometres from Turkey’s border with Bulgaria, the European Union appears to be within easy reach. But for the dozens of irregular migrants and asylum-seekers who attempt the crossing every day, the short journey is far from easy. The border between Turkey and Bulgaria is marked by two rows of tracks and a communist-era fence, now in disrepair. It is monitored by security cameras and border police teams. After failed attempts to cross the border into Bulgaria, dozens of migrants walk through the village of Uzgac almost daily, according to Cenk Yilmaz, a part-time resident of the border village, who said they were often injured. "Bulgarian police beat them always," he said. Zayed, 16, second from right, was among a group of Afghan men walking through the Turkish village of Uzgac who reported being pushed back from the border by Bulgarian police. Ferhad*, a 46 year-old Kurdish Syrian from Qamishli, has tried to reach Bulgaria five times. Bleary-eyed and emaciated, Ferhad said he was trying to get to Europe to help support his wife and six children back in Syria. When Bulgarian police intercepted the group he was travelling with on his last attempt to cross the border during the second week of March, "They beat us like they wanted to kill us," he said. Afterwards, police put them in a truck and drove them to a remote location on the border and told them to go back to Turkey. Ferhad, now in the border city of Edirne, showed IRIN a large bruise on his hip and a swollen knee where he said he had been struck. Ferhad shows bruises he says were inflicted by Bulgarian border police when he tried to cross the border. Around the same time that Ferhad and his companions were making their last attempt to cross the border, a group of 17 Yazidis were doing the same. Increasing numbers of Yazidis, an ethnoreligious group that has been targeted by IS for particularly brutal treatment, have been trying to reach Western Europe in recent months. One of the group, Haci Halo, 29, later told Turkish journalist Engin Ozmen, that shortly after crossing the border on foot, the group had encountered Bulgarian border police who beat them severely with night sticks before sending them back to Turkey. Halo said he carried his friend, Dalil Murad Ilyas, 35, whose leg had been broken during the beating, for about five kilometres before leaving him near a village and going for help. Ilyas died of hypothermia before help arrived, according to the official autopsy report. Another of the Yazidis, Mohammed Jawad Kadhim, 30, suffered a similar fate. A local resident of Uzgac named Cetin, encountered a man on the evening of 7 March. “He was tired, wet, frostbitten and ill,” recalled Cetin. The man that he rescued did not speak Turkish, but after being taken to a hospital, he reported through a translator that his friend, Kadhim, was lying injured near the village. Cetin was part of a search-and-rescue team made up of 15 local men and Turkish gendarmes who found Kadhim’s body the following day. He said the body showed serious injuries. Autopsy results also recorded the cause of death as hypothermia. When they located the body, Cetin confirmed that the deceased was wounded. When asked if he thought the man died as a result of police torture, Cetin said, "I am certain." The bodies of Ilyas and Kadhim have been returned to their families in Iraq. The remaining Yazidis in the group reportedly accepted voluntary return to Iraq after being treated for their injuries and sent to a removal centre in Turkey’s north-western Edirne Province. Ferede Sarar Gecer, 82, said that every day dozens of migrants pass through her village, which lies on the border with Bulgaria. She says she gives them food and tea. The Bulgarian authorities released a statement on Monday indicating that a joint investigation into the incident is underway, with officials from both the Bulgarian border police and the Turkish gendarme involved. Boris Cheshirkov, a spokesperson with the UN Refugee Agency (UNHCR) in Bulgaria, told IRIN that UNHCR had received many testimonies from asylum seekers denied entry into Bulgaria or pushed back across the border. In November 2013, the Bulgarian government established a new policy for dealing with a sharp rise in the number of irregular entries from Turkey resulting from the war in Syria and the virtual closure of Greece’s land border with Turkey. The so-called “containment plan” included increasing the number of police at the 240 km long border by 1,500, and the construction of a 33 km barbed-wire fence in an area where many irregular migrants had been crossing. A prototype of the fence Bulgaria is building on the 'green border' area where thousands of migrants have crossed into the EU over the last year. Since then, the number of asylum-seekers and migrants crossing the border has decreased by nearly 50 percent, according to figures supplied by the Bulgarian police, from 11,524 in 2013 to 6,023 in 2014. Officials tout the decrease as evidence the containment plan is working, while critics argue it has been achieved through pushbacks. An undercover investigation by Bulgarian National Television that aired in December 2013 showed senior police officers, filmed with hidden cameras, ordering that migrants be pushed back, and beaten if necessary, as part of the containment plan. In it, a junior border police officer is told, "you will stop them and send them back." When he asks his superior how women and children should be dealt with, he is told to be careful. "Pick up and beat the men," says the supervisor. A Bulgarian border police officer at the Elhovo Border Police station, where migrants are held and processed before being sent on to detention centres or centres for asylum seekers. Bulgarian officials have long insisted that the fence and beefed-up border security are meant to funnel migrants to official checkpoints, where they can file their asylum claims. As a signatory to the 1951 Refugee Convention and as an EU member state, Bulgaria is required to admit those seeking protection and give them the opportunity to apply for asylum. A 2014 Human Rights Watch report claims that the containment plan “effectively slammed the door to new arrivals”. Many of the 177 refugees from Afghanistan, Syria and Iraq interviewed by HRW described being beaten and summarily returned to Turkey by Bulgarian border police. 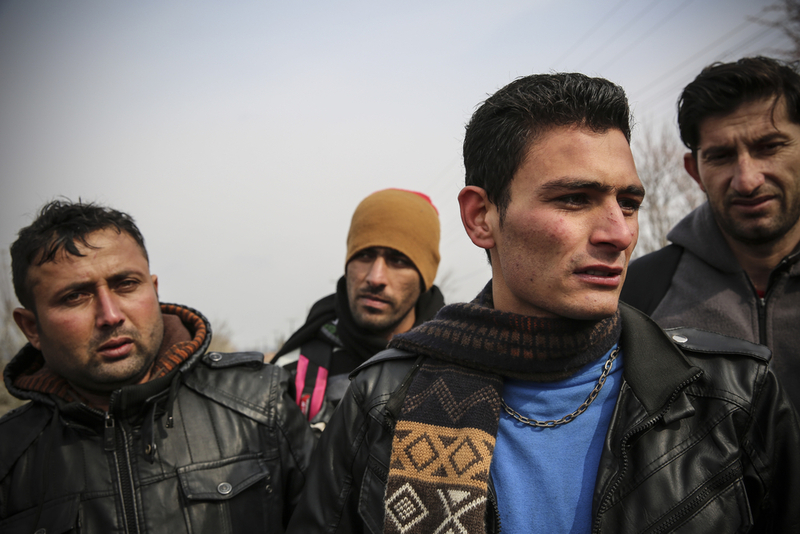 Abdul Nafi, 26, from Afghanistan, is currently staying in Edirne, the Turkish city nearest to the Bulgarian border. He tried to cross the border on foot, but was turned back by Bulgarian border police. He said the police beat him and his friends with batons and told them to go back to Turkey. According to a report released in January 2015 by local human rights NGO, the Bulgarian Helskinki Committee (BHC) in conjunction with the European Council on Refugees and Exiles, the policy of refusing entry to asylum-seekers, the majority of whom are from Syria, Iraq and Afghanistan, has continued. Police records cited by BHC show that 6,400 third country nationals were officially refused entry into Bulgaria in 2014 and returned, mainly to Turkey. According to the lead author, Iliana Savova, this number reflects only those who presented themselves at border checkpoints and were refused. It does not include those pushed back by Bulgarian police from other locations along the border. View of the Kapikule and Kapitan Andreevo border checkpoint. To the left is Turkish territory and to the right is Bulgarian. Out of a total of 11,000 people who registered asylum claims in Bulgaria in 2014, according to the Bulgarian State Agency for Refugees, the BHC report notes that 4,041 were made at national borders. Savova explained that some asylum seekers, mostly Syrians, were able to apply for asylum at official border checkpoints where BHC has monitors. Migrants told IRIN that those with more resources pay smugglers to help them cross at more remote points along the border and then drive them directly to the capital, Sofia, sometimes hidden in containers that are loaded onto trucks. Border Police use military trucks to reinforce the 'green border' a popular crossing point for asylum seekers. Photography and story by Jodi Hilton in Erdine. Edited by IRIN's Migration Editor Kristy Siegfried.